The term 'arts and crafts' can relate to various projects and has a different meaning to each person. Damien Hurst, Banksy and Yayoi Kusama are all classified as artists but create very contrasting works from one another. You might produce abstract art whereas someone else might design their own wedding stationery. 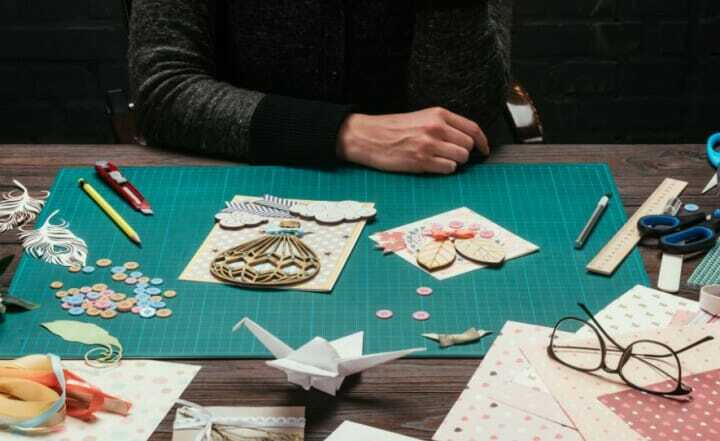 Creating arts and crafts is a much loved hobby for many of us and although drawing and painting still remain the two most popular craft activities in the UK, with high street trends influencing craft and paper craft trends, we expect to see an increase in the popularity of paper crafts amongst aspiring artists. So no matter whether you prefer to create fabulous craft projects such as handmade Christmas cards, gifts and home accessories, whether you are set to be the next Pablo Picasso searching for new and exciting products to make your creations stand out, or if you want to try out a newly found hobby, Stamps4U has the right products for you. Our selection of popular arts and crafts products from various leading brands will be sure to get your creative juices flowing and add an extra touch of sparkle to your fantastic works. A great way to improve your drawing skills is to mix up your shading techniques. So if your forte is sketching portraits and still life, Spectrum Noir's pencil sets are a great item to add to your stationery collection. The Colourblend & Aquablend pencils contain premium pigments to provide a wide variation of tone, perfect for shading with or without using watercolour. One of our top-selling items, the Viva Decor Water Tank Brush Set contains 3 water tank brushes in various sizes, ideal for colouring with ink or watercolour. Whether you want to create small pieces of wall art, thank you cards or even larger arts and crafts projects, with the water tank brushes all you have to do is fill the brush with water to create amazing effects. Decorating your child's room or making your own greetings cards? With these fabulous Sue Dix Designs Clear Stamps, simply pick your favourite design from a wide selection, align on your choice of material, add your ink and stamp your impression. Perfect for multiple use, you can use these designs over and over again creating fabulous artwork all around your house. No matter whether you and your child are looking for inspiration for your next big collage or are looking for supplies to try out new techniques, you won't be short of ideas with the Sweet Dixie Card Stock. The cards are available in a selection of vibrant colours, perfect for designing your own invitations, cards or for fun art projects. Each card pack features 25 sheets of 240gsm card giving you plenty of material to work with. For an arts and crafts fanatic there truly is nothing better than keeping your cupboard fully stocked of all of your favourite products until your next creative burst. But, if you still haven't found exactly what you're looking for, our selection of items doesn't end there. Take a look at our arts and crafts section where you will find everything you are looking for for your next big venture.